Right wing lawmakers in Chile’s Chamber of Deputies hold a minute of silence on the eighth anniversary of Pinochet’s death. 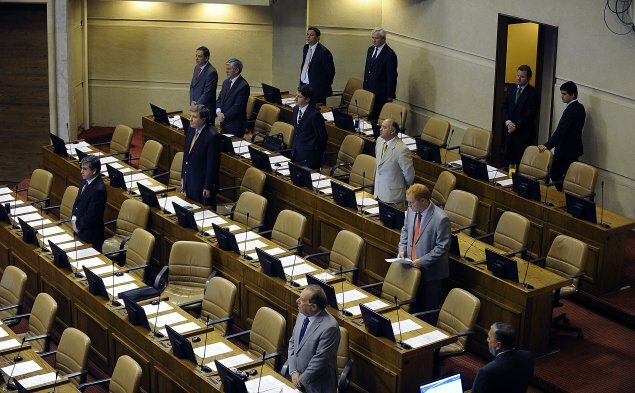 And a group of lawmakers from Chile’s rightwing Union Democratica Independiente (UDI) party tried to hold a moment of silence in Pinochet’s memory. Ignacio Urrutia made the motion in the Chamber of Deputies, prompting lawmakers from other parties to walk out in protest. One politician from the Party for Democracy (PPD) remained in the chamber in order to break the silence, while a number of younger UDI politicians remained but did not take part. Not exactly representative of Peruvian children–a page from the Saga Falabella Christmas catalogue. Four little blonde-haired girls beam at the camera. They are holding dolls (three blonde, one redhead), and the photograph is part of a Christmas catalogue distributed by a Chilean department store’s Peruvian affiliate, Saga Falabella.